For the past few years I've thought about how awesome it would be to be a part of a show at Gallery1988. Finally that goal was realized when I was asked to participate in the "Tribute to Judd Apatow Show" that opened at the Melrose location last night. Judd Apatow himself was there as well as Seth Rogan. Sadly, no I was not there but being a part of the show that included artists that I'm big admirers of was one of the biggest treats I've gotten this year. "The 40 Year-Old Virgin" is still one of my favorite Judd Apatow films and Andy's obsession with old action figures really spoke to me. For a while I've been wanting to paint Andy as an action figure from the late 70s complete with packaging reminiscent of "The Six Million Dollar Man" figures. The piece, titled "Bionic Andy," is acrylic and mixed media on 15" x 20" illustration board and is for sale at the Gallery1988 Melrose location. The Judd Apatow tribute show runs through the end of the year so if you're in LA, go check it out! 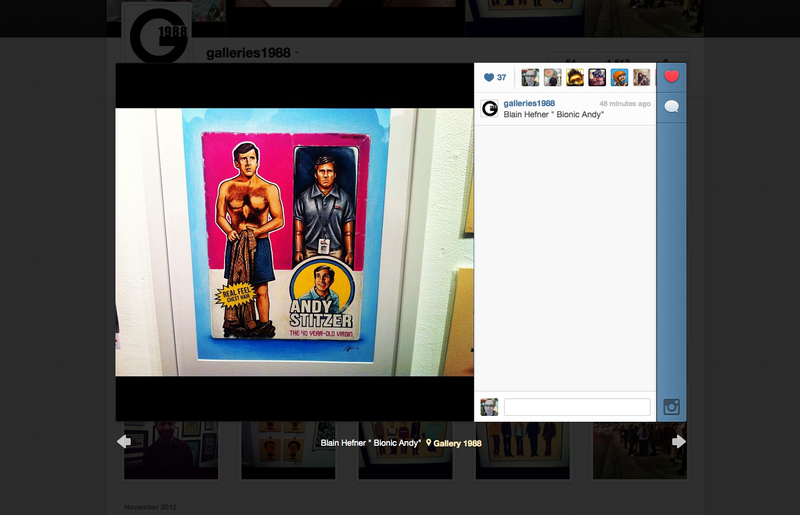 Also I was honored that G1988 also featured my piece on their Instagram feed!